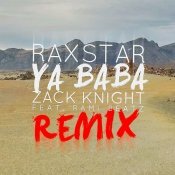 Raxstar releases his brand new Remix of Zack Knight’s hit single “Ya Baba” featuring Rami Beatz! Available for FREE DOWNLOAD!! After the immense success of his previous single “Main Aur Tum” Zack Knight is finally back with his highly anticipated brand new smash hit single entitled “Ya Baba” featuring Rami Beatz! ARE YOU Rami Beatz? Contact us to get a featured artist profile page.